A group of scientists and businessmen have come up with a unique eco-friendly technology that extracts amorphous silica from rice husks. Production will be developed in rice-growing countries. Risilica, a fledging Moscow-based company that unites scientists and innovative businessmen, has recently solved an old scientific puzzle on how to produce saleable amorphous silica, used in construction, tire production and the pharmaceutical industry, from previously unusable rice wastes. The technology of incinerating rice husks and extracting amorphous silica has been patented by many of the world’s chemical companies since the 1920s. However, it only worked in laboratories. When it came to real technological conditions with high volumes, it has never been very successful. “It took us almost three years, several scientists and seed capital from the Russian Venture Company to create a unique green chemistry technology that will allow us to significantly cut hazardous emissions from burning rice husks and contribute to the minimization of the greenhouse effect,” said Alexander Komarov, a managing partner at Risilica. Russia’s annual rice yield is 1 million tons with husks accounting for 20 percent of the volume. It means that 200,000 tons of rice waste is left unutilized as it cannot be used for fodder or organic fertilizer because of the high concentration of silica. This is why rice husks combust, polluting the air with fine dust particles that are then deposited in the lungs of people, which causes silicosis. At the same time, amorphous silica, which makes up over 20 percent of rice husks, is in high demand in various industries. For example, tire makers use it to minimize rolling friction and make a vehicle safer and more eco-friendly as it consumes less fuel. The method proved successful and eco-friendly as they used only rice husks, deionized water, sulfuric acid for chemical cleaning, carbamide and air. The final product contained 99.99 percent pure amorphous silica. According to Komarov, Risilica’s product is three times cheaper than a similar product produced by large corporations. 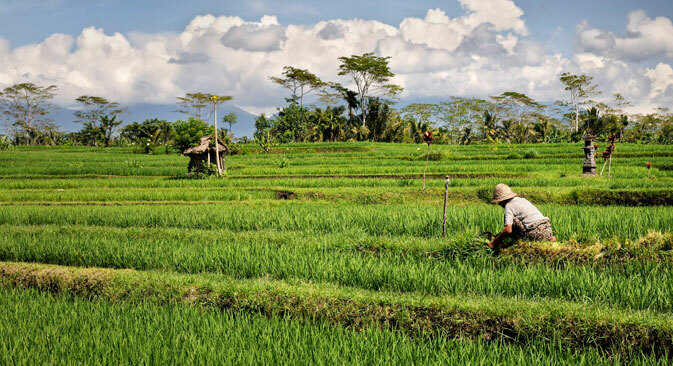 According to the Food and Agricultural Organization of the United Nations, global production of rice, the majority of which is grown in Asia, totaled 746.4 million tons in 2013. This means that the volume of unused rice husks amounted to 150 million tons. However, Komarov is cautious about entering the Chinese market since all foreign technologies are vulnerable to being replicated by local entrepreneurs. Instead Risilica is more oriented towards Indonesia and Vietnam, which is also closer to raw material supplies. “The company will facilitate logistics by providing technological solutions and equipment that will in turn boost the Russian machine building industry since all the equipment for rice husk pyrolysis is produced in Russia,” Komarov said. As Risilica is planning to unveil a full production cycle facility in late 2016, it is poised to be a pioneer of green chemistry projects in Russia, a sector that has the potential to further diversify the Russian economy. Green chemistry is extremely popular throughout the world. Obviously, if the project demonstrates its economic efficiency, it could be used in countries where rice is a key crop. However, the main problem that the majority of green technologies have is that the products they produce turn out to be more than traditional technology. Therefore, companies will need to prove in the very near future that their products are economically able to compete, or they will need to find a niche in which it is more expensive to ship products derived from traditional technology than it is to buy products made from Risilica’s technology. Tech startups now dominate a venture market. However, more and more investors seem to be surfeited with IT projects and they are looking for new ventures. In this regard, eco-startups including green chemistry projects seem to be the most promising ones. Risilica has already gained international attention while being the only Russian company that took part at the APEC Accelerator Network Summit held in Taipei in August. Moreover, the International Rice Research Institute has expressed interest in carrying out joint research on amorphous silica.